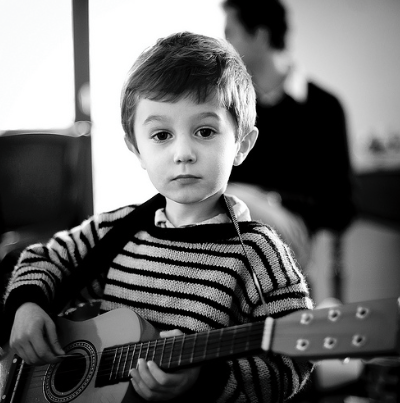 Many parents worry that they may be too strict with their children when it comes to learning guitar. Their main fear is they will turn them off music forever. We have all heard stories of adults who say as a child they were forced to learn a musical instrument but many of these examples do not give the full story. Many adults have negative memories of a childhood revolving around daily arguments with their parents sometimes resulting in complete rebellion usually by their early teens. In search of the source of such arguments they often site being forced to learn a musical instrument. The problem with this theory is it concludes that when children are forced to learn something against their will they automatically resent their parents but we know this is simply not true. In fact much of our childhood is made up of forced learning yet we show very little if any resentment toward our parents for forcing us to read, write, solve math problems let alone forcing us to go to school and learn for 6 hours a day for 12 years. Are you strict about teeth cleaning? My guess is you have no hesitation in insisting your child to go to bed on time, brush their teeth, do their homework etc but do you treat guitar practice the same? There is nothing wrong with being strict about their practice just don't be cruel. By cruel I mean there is no need to physically or mentally inflict punishment onto your child. When your child does not practice simply send them to their room and withdraw all privileges like TV, Internet etc until they have done their practice. It really is that simple. Once they realise there is no negotiation they will practice without resistance and the result will be progress which in itself becomes the motivator. This strategy works but you may very well get a few tears and tantrums early on but its quite normal. The ability to play a musical instrument like guitar should not be underestimated. The guitar has given me thousands of hours of pleasure. Its also a great way to make friends and be sociable. Many of my best memories are of jams in a room filled with musicians. Learning music also develops the brain in a way that in recent years has been found to reduce the effects of brain ageing (E.g. dementia) not to mention the many findings around general cognitive improvement. If physically exercise is good for your body I believe learning a musical instrument is equally good for your brain and general well being. In this age of instant gratification learning to play a musical instrument also offers children important life lessons around learning skills that take time to develop. The ability to play a musical instrument is a gift that any parent can give to their child. Tips on helping your child to succeed. Realistic expectations. Many children think learning guitar is all fun and no work. Dispelling this myth from the outset will set realistic expectations. Get involved. Parents who leave it totally up to their child will usually be disappointed. Getting involved builds confidence and encourages practice because all children seek parental attention. At first sit with them everyday. Even better try learning with them. Overtime you can gradually back away. Be consistent and persistent. Set a time each day for practice and stick to it. E.g. 5 pm each weekday. If their routine is broken try to get back on track asap. Make it a game. When they are doing a particular exercise make a game out of it. Clap along. Sing along. Point to notes and ask them the names of notes. Monitor their progress. If they know you are cheering them on they are more likely to want to practice. Children love to impress their parents but to impress you they need to see that their achievements matter to you. Applaud even the smallest of achievements. Praise behaviour over results. The behaviour we seek is simply daily practice. Try not to focus on results too much. Praising them for practicing will encourage more practice. If its all about results children are more likely to give up before they get a result. Communicate with their teacher. I (David Hart) have personally been teaching guitar for over 25 years and I have noticed that when parents ask questions they are better able to help their children in the learning process. Focus on the positive. Its best to look at what they are doing well and highlight the fact. E.g. "WOW! 3 hours of practice this week. Isn't that a new record?" Focus on practice. - Remember its the habit of practice we want to cultivate. Studies show that results come ultimately to those who practice the most. Ask your child to teach you. Children love to show off what they know. If you get them to give you a lesson every week it will reinforce their knowledge while also boosting their confidence. "I cannot get her to practice at all. HELP"
Please follow the link to download our free online course.